Happy Lovely Little Lumps Hump Day! It's an old reference but it works! Happy Hump Day, everyone! Can't believe that actually has caught on and become a normal saying now. Well, it works for us because there's no better way to get over the middle of the week than with some nice, fresh sushi. So fantastic at any time of the week but it's especially nice when you've had a rough time at work and need to reward yourself from all the stress you endure. So come on in and have a few lovely little lumps with with us! Sushi World LOVES the Philippines! Our hearts go out to all those affected by Typhoon Haiyan. This affects us all, near or far. Every little bit helps. Sushi World LOVES the Philippines and we want to show it. 10% of all proceeds tomorrow, Tuesday, November 19, 2013, will be donated to typhoon relief. Please come out and show your support. Like our Caterpillar Roll, the Spider Roll is not what it sounds. Its center actually consists of soft shell crab (the delicious underwater spider kind), cucumber & avocado. It's accompanied by gobo & some radish which complements it beautifully. Happy Hour starts now! Ditch whatever you're doing and come on in! Unless you're babysitting, then bring the kid along. Did you forget about lunch again? If so, come on in and try out our Three Amigos Roll! 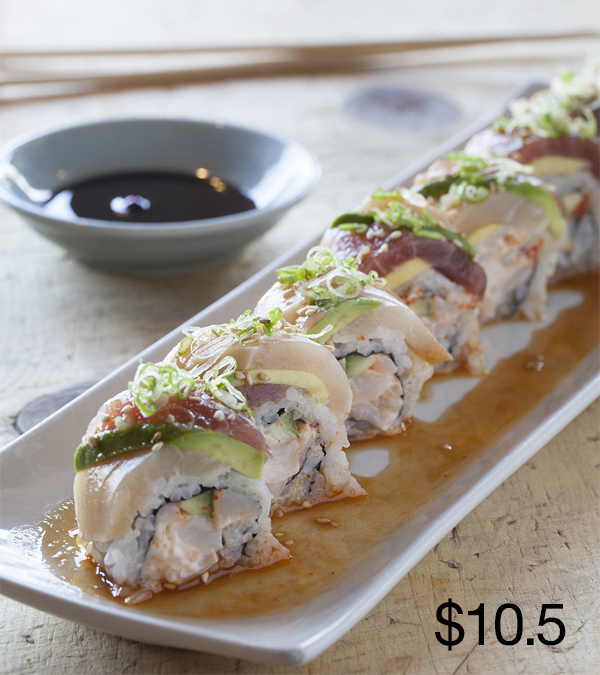 It features a spicy scallop roll topped with avocado, tuna, albacore, and then lightly dressed with a poke sauce. Yummy yummy in your tummy. But only if you come in now. Does not require 2 other friends. Can also be eaten for dinner. But why wait? Come in now!